This is the first time this has ever really been an issue, but with the projected box office numbers this week, it won't be worth going as much into specifics until the final numbers are released tomorrow. We expected there to be a large pileup with a few of the new films this weekend, but with two of them projected with the exact same dollar amount, we're still unsure which will ultimately be crowned weekend champ. "House at the End of the Street" and "End of Watch" grabbed the top two spots, but "Trouble With the Curve" wasn't far behind. The fourth wide release this weekend, "Dredd", was the real surprise; it had by far the largest budget of any of the new releases this weekend, but still managed the lowest total by far. We'll start with both "End of Watch" and "House at the End of the Street", as currently, they're both projected with $13MM grosses. This is a million or so short of what I expected from the top two films, but whichever they ended up being, I did expect two of the new ones to be sitting very near each other. Again, there's a lot of small changes that can (and will) take place between now and tomorrow, but regardless, it seems that these should be the two films at the top when all is said and done. If these numbers hold, and these films are to finish with the exact same amounts, you'd have to assume "End of Watch" would be proclaimed the "winner". With a budget of only $7MM compared to the still reasonably small $10MM budget of "House at the End of the Street", a stronger profit was made with the first film. Likewise, "End of Watch" opened in about 300 theaters less than "House at the End of the Street", so again, even though it's minimal, the $4,700 "End of Watch" compiled as a per theater average does slightly outperform the $4,200 per theater average by "House at the End of the Street". Another thing that you could look at would be that "End of Watch" has an R-rating, while "House at the End of the Street" is only PG-13; technically, "End of Watch" had a smaller audience to work with but still managed more bodies per theater than "House at the End of the Street". These are all minor victories, but really the only ways to separate these films by just stats alone. As the content of their movies, I'd expect "End of Watch" to have stronger holds moving forward, due mostly to the extreme differences in their critical reactions. "End of Watch" still looks really strong, holding a 85% on Rotten Tomatoes, while "House at the End of the Street" is sitting at a dismal 14%. The most ironic aspect to all of this is I expect "House at the End of the Street" to pick up a few extra dollars in the final rankings, which will crown it the weekend champ. Both films should remain close, and even if HATES ends up with the top dollar amount this weekend, it seems clear that "End of Watch" did more overall. Coming in third this weekend was "Trouble With the Curve". While unlikely, it seems that this film could still finish at the top spot if projections don't hold as well as expected. 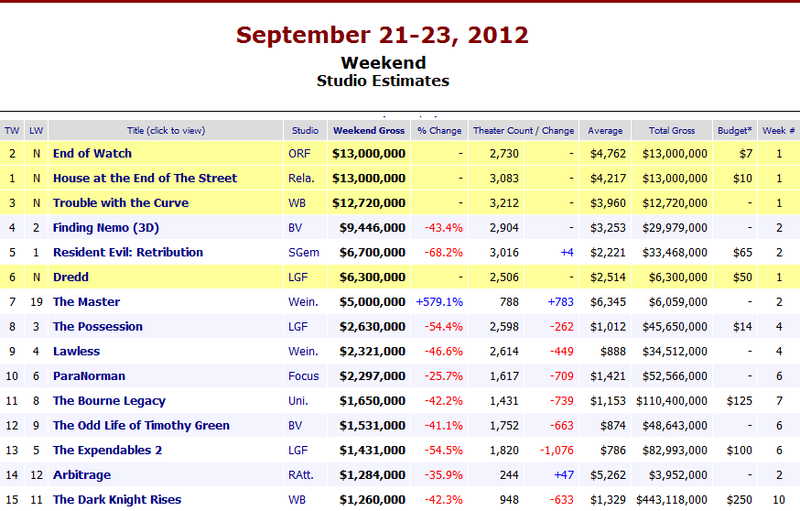 With $12.7MM this weekend, it's only $3K behind the top two films. I expect this to remain in the third slot this weekend, but it put a tighter bunch at the top than I figured. No official budget was declared for the film, so I'm unsure of how this total stacks up against it, but I don't expect it was anything terribly high. I'm sure the studio behind this film had higher hopes than finishing third over this weekend, regardless of totals though. 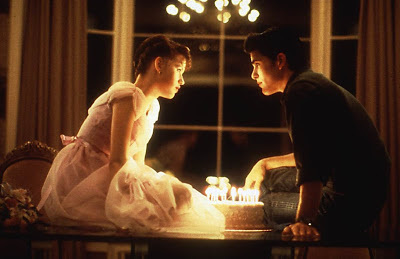 The film opened in just over 3,200 theaters, resulting in a $3,900 per theater average. "Trouble With the Curve" appeared in more theaters than any other film this weekend, resulting in a less than $4K per theater average, and well behind the pace of the two films ahead of it. If you're looking for a fun little factoid stat for the film, you can point to this having the sixth-highest opening weekend of all-time for a film about baseball. "For the Love of the Game" opened with $13MM back in 1999, and sits in the fifth spot just ahead of it. Rounding out the rest of the top five this weekend were two of last weekend's films, "Finding Nemo 3D" and "Resident Evil: Retribution". Nemo made $9.4MM this weekend, with a moderate 43% drop from last weekend, while "Resident Evil: Retribution" made only $6.7MM, a tough 68% drop from last weekend. I have no idea how much money was put into converting "Finding Nemo" to 3D and getting it redistributed to theaters, but for what it's worth, the film has now made nearly $30MM in the last two weeks. "Resident Evil: Retribution" on the other hand, surpassed the $30MM mark with its gross this weekend, however its domestic totals still only account for about half of its $65MM budget. Luckily, the $103MM its made internationally should more than make up for that and already has the film more than doubling its original investment. In only ten days it broke the $100MM mark internationally, and that should be good enough to ensure we get another one of these movies in the near future. I'm not sure why these films continue to perform so well, but as they continue to spiral downward domestically with each subsequent release, the international totals continue to soar. That brings us to the sixth position this weekend, where we're finally greeted with the final wide release, "Dredd". I think most everyone expected this to be somewhere in the group with the top three films this weekend, but with only $6.3MM, it wasn't even close. With a $50MM budget, this was a big miss by Lionsgate, who produced the film. There's still a chance the film could rebound and shrink the gap, but with only $6MM in its opening weekend, it appears that this one might go unnoticed. There is a chance that the movie could make some big money internationally, but with no roll out yet, I'm unsure of the studio's plans in that department. This does seem like a movie that could play well overseas though. The film has actually reviewed very well, currently sitting at a better-than-expected 77% on Rotten Tomatoes (our own Derek Clem also had some positive remarks on the film). We'll have to see what this one can do in the next couple of weeks, but I expect we've seen about the last of this one, even if it does appear to be a better than average sci-fi feature. If you wrote this one off completely the first time around though, you might want to reconsider and possibly give it a chance in theaters. No real notable milestones this weekend, and at this point, we're mostly just pushing the bad films down and trying to get them out of the top spots. The overall box office continues to rise though, even if not very quickly. We're again up from last weekend's overall numbers, a trend we'll hope to continue next week when new films like "Looper", "Hotel Transylvania", and "Won't Back Down" hit theaters.